Serves: 8 people Difficulty ': Easy Preparation time: 10 minutes plus cooling Ingredients 10 lemons (preferably untreated) 300gr. 250g caster sugar. 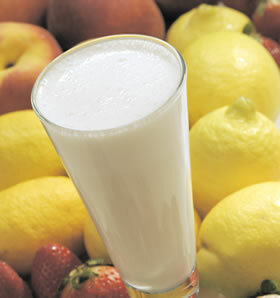 water 1 egg white PROCEEDINGS -------------------------- Wash lemons, squeeze and cut the rind of four lemons in strips. Boil sugar with water, half 'of the lemon juice and sliced peel. Cook for 5 minutes, strain and cool. Combine the juice was filtered and poured into ice cream maker, following the instructions. In the last 5 minutes add the whipped egg white.